Mysterious. Romantic. Humorous at times. Jake and Lindsey are in love, but so much stands in their way. Letters from a dead man. Separation and jealousy. Unwanted advances from a transgender acquaintance. A few things in the couple’s favor? They are smart, multi-talented, and they love to laugh. 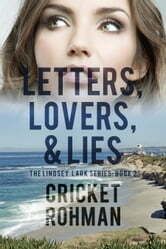 Lindsey, a newly appointed keynote speaker, goes on tour while her boyfriend, Jake, writes a detective novel. Sounds simple enough, but a mystery soon dominates their lives when bizarre notices of her ex-husband’s funeral arrive. Foul play is suspected and murder is on someone’s mind. Lad, a retired Secret Service agent, is her right-hand man for the duration of the tour. He’s handsome, he’s a man of few words, and, as the list of threats lengthens, he takes on the role of bodyguard, much to Jake’s dismay. Come along with Lindsey as she celebrates Thanksgiving and Christmas and her new career, which takes her to Denver, Austin, San Diego, and Seattle, where danger lurks. Will love follow?